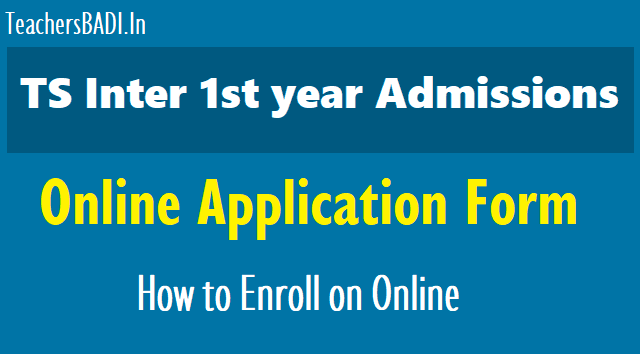 TS Inter 1st year admissions Online application form, How to enroll on Online for TS Inter 1st year admissions, Stepwise procedure for TS Inter 1st year online enrolment, Inter 1st year admissions Online Enrolment at http://bie.telangana.gov.in, Online Enrolment for Inter 1st year Admission in to Telangana Govt Junior Colleges /Govt Vocational Junior Colleges. The CIE Telangana has given instructions on Online Intermediate first year admissions 2018-2019 and given additional facility for Online Enrolment for Admission in to Government Junior College/Government Vocational Junior College for the academic year 2018-19. Step 3: Student selects collages courses from the displayed list and student will be allowed to enrol in maximum 3 colleges only. Step 4: Student can enrol by entering the qualifying exam hall tickets like SSC Hall ticket. Step 5: One Time Password (OTP) will be sent to the student and Parent Mobile number to confirm registration. The mobile number should not repeat to more than two student registrations. Step 6: After OTP is correctly entered in enrolment form the student's enrolment will be saved. Step 7: After enrolment is saved SMS will go to student with details of college for which the students is enrolled, group, medium etc. requesting the student to report to the principal with orginal certificates with in three days. Step 10: Principal will allot the seat once he is examines all original certificates. In this regarding Certain Instructions have been isued. The District Intermediate Education Officers/Principals of Government Junior Colleges/Government Vocational Junior Colleges in the state are requested to follow the instructions for admission in to Telangana Government Junior Colleges/Government Vocational Junior Colleges for the academic year 2018-19. And bring the awareness in the students, in addition to the existing admission procedure. 1. In addition to the normal existing procedure of the admission in to TS G.J.Cs/G.V.J.cs, the Student can enrol his name with full details on online in the prescribed format provided in Commissioner of Intermediate Education website, www.cie.telangana.gov.in ( the same is enclosed herewith for ready reference ). 2. For enrolling online, the student has to select District in which he desires to take admission. 3. Based on the District / Mandal selected by the student list of Government Junior Colleges /Government Vocational Junior Colleges available in that Districts will be displayed to the student online. 4. Student can enrol Maximum of 3 Colleges in which he desires to take admission. 5. Student has to enter his Mobile Number to complete his enrolment form by entering OTP received to his mobile number. 6. Once registration is completed SMS will be sent to the student with details of the Colleges he opted and Original certificates to be carried to the College within 03 days. 7. In the Principal login the online enrolled students details will be made available. 8. Permission will be given to the Principal to change the Group/Medium/Second Language. 9. Once student is present with Original Certificate along with T.C., the Principal will allot seat to the student in admission module. All the Principals of G.J.Cs/G.V.J.Cs in the state are instructed to allow the admission for the student enrolment received Online also in addition to the existing process of admissions.